Hey teacher friends!! 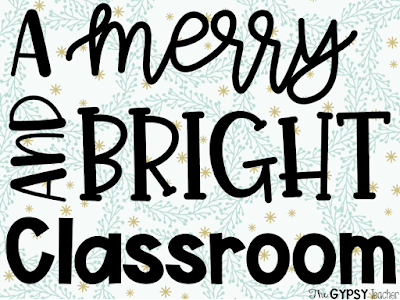 Happy Holiday Season and welcome to the blog series, A Merry and Bright Classroom! Each weekday over the next THREE WEEKS (December 3-21) I will be sharing a blog post with you that gives you tips, inspiration, encouragement, resources, and even GIVEAWAYS to help make your classroom merrier and brighter this holiday season! I LOVE Christmastime: it is the most magical time of the year! But I know that it can sometimes be a little hectic in our classrooms. The weather is cooling down (or heating up, if you're in Tanzania! ), the kids are feeling the excitement of the approaching holidays, and we're counting down the days to break! I want to make this holiday season easier for you, and hone that student excitement to make every day count! I'm excited to kick this blog series off tomorrow, but before we get started, I wanted to bring up an important point: everyone celebrates differently! You can probably tell that I'm all about the Christmas spirit, but you may not be, and that's great! You may have students your class that celebrate Hanukkah or maybe nothing at all. I love this online teacher community, because we get to learn from other teachers who help us do better. MoNique (@itsmoniquesworld) and Asmahan (@teachingwithsugarandspice) have created an amazing and FREE Family Holiday Communication Survey for you to send home to your students' families to respect their values and traditions! Click the picture below to go download it! And then also click on these ladies' names and IG handles to follow their TpT stores and Instagrams! They are AMAZING! So set your alarms for tomorrow! Each blog post will be posted at 8 am CST each day Monday through Friday! Also, Fridays will be EXTRA special...but that's all I'm going to say right now. Just make sure you come on back for that! ;) OR even BETTER: sign up below to get these posts sent right to your email! Then you don't have to remember to read each day's post, it will automatically show up in your inbox! Don't worry, I won't spam you, and once this series is done, I won't send any more emails! I'm SO excited for this month of fun!! Merry EVERYTHING and Happy ALWAYS!